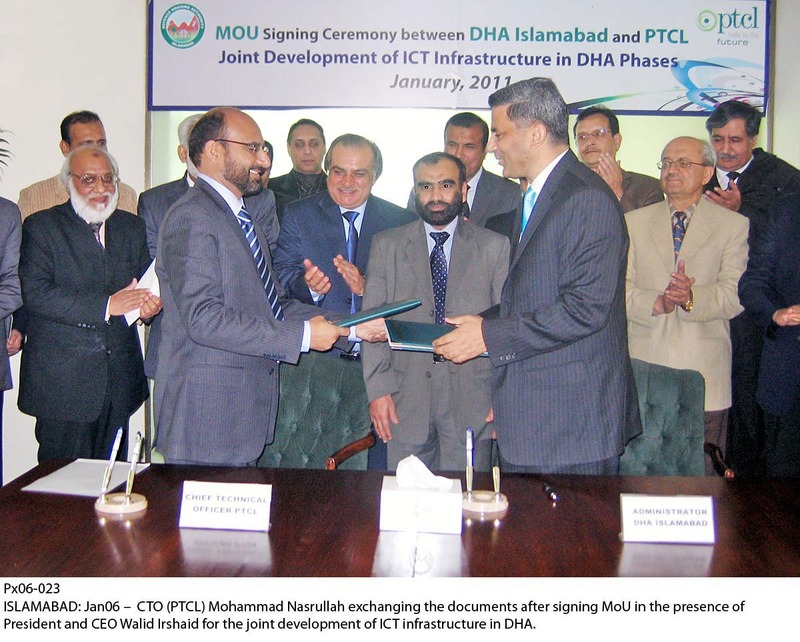 DHA Islamabad has signed MOU with PTCL for providing ICT services for all phases / blocks of DHA i.e. Phase-I, Phase-II, Phase-I Ext, Phase-II Ext, DHA Valley etc. The DHA has planned for more than 150,000 houses in their several phases. PTCL has already provided PSTN and broadband services in Phase-I last year which is now planned for further expansion. DHA phase-II has planned for more than 10,000 houses and approx. more than 2,000 houses are in place or under construction and to be completed very soon. The residents of this phase were deprived of communication services and connectivity with rest of world. Hence, DHA had to engage this partnership with PTCL for ICT services to their members/residents. This MOU will bring new information highways and futuristic product basket for the resident of DHA. The MOU ceremony was signed by Chief Technical Officer PTCL and Administrator DHA Islamabad in the presence of President PTCL and Vice President DHA at DHA building in Phase-I, Islamabad. This new year bring good news for the resident of DHA in shape of this MOU.